Apple recently announced the iPhone 8, 8+, and X (called 10 to commemorate the 10th year of the iPhone) and with that announcement was the shock that they will keep most of their older phones for sale as well. 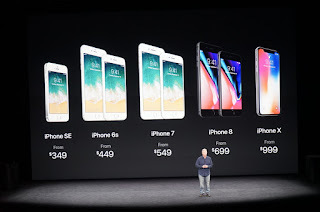 For the last few years when Apple announced a new phone, the previous year models would remain on sale for a slight discount and the 5se which is a smaller 4” phone for those that don’t want a bigger phone. For 2017, Apple will keep the se, 6s, 6s+, 7, 7+ and add the 8, 8+, and X models to the lineup. This is a good thing for Apple even though it goes directly against how Apple previously marketed their phones. The idea used to be nothing more than necessary, which resulted in one phone, in one size and maybe a previous year model. Then it changed to a new phone in two sizes, plus last year’s models, plus the tiny se. For 2017 you’re able to get 3 new phones, last year’s model in two sizes, the year before that model in two sizes, and the se. The reason why this is a good thing? Apple now has phones priced to compete with the sub $500 market that Android dominates right now. For $500 or less you can purchase any number of quality Android phones namely the OnePlus 5, Moto G, Honor 8, etc, and now you can purchase a new iPhone for the same price.